This monster’s been in my workshop for a few months now. 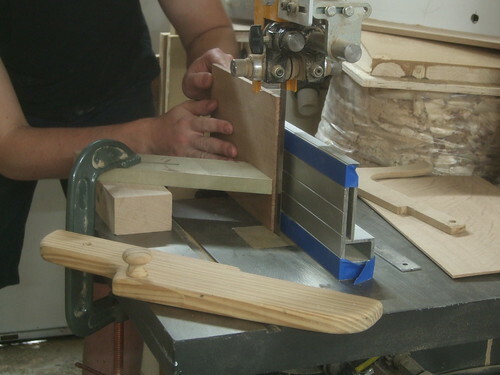 In that time, I’ve been able to do just about everything with it – from cutting curves and shaping, to to forming lap joints and deep-ripping wide boards of hardwood. There isn’t much that I haven’t already done with it [I’ve even broken a blade and ripped the tyre off the top wheel!!] so, I think it’s about time I gave my verdict. To get the negatives out of the way first, the table (or bed) really is too low for my liking. This does help when you’re trying to cut a large lump of wood but, for small, delicate shaping, it’s almost uncomfortably low for anyone of average height (I’m about 6ft2in). 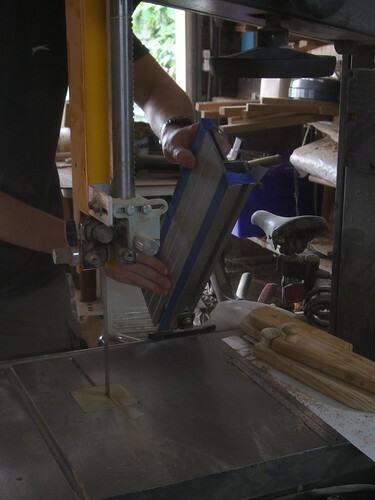 As with too many bandsaws [and mitre saws, for that matter!] 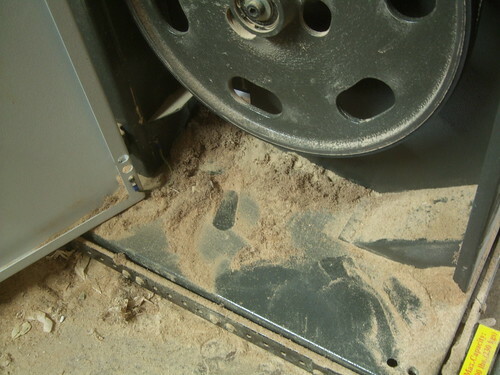 on the market, dust extraction is hardly ideal on this machine, with only a single 5in/125mm diameter port in the bottom left-hand corner of the unit. Perhaps it is more effective with an equally industrial-rated extractor though, I can still imagine the lower blades guides still getting covered with fine dust. 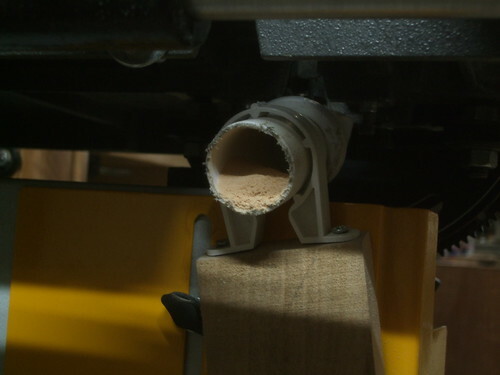 That’s why I added my own solution for hooking up a vacuum cleaner (as you may recall seeing on my SIP bandsaw and in a recent issue of British Woodworking!). Again, this greatly improves the situation and, when I bother to connect the hose, hardly any dust gets below this. I’ve had to lower the yellow guard to gain access in here, which does a good job of keeping your hands clearing of the running blade (not that I’d put my hands anywhere near here while the machine’s going, anyway!). 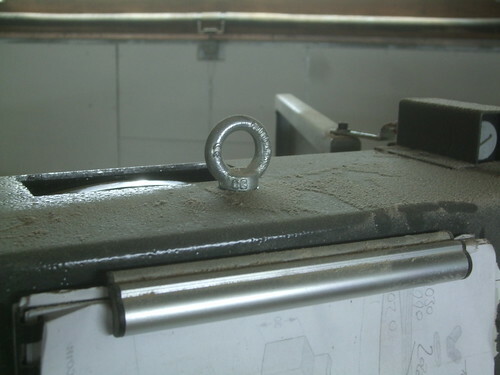 This guard is large and flat enough to allow me to attach the mounting block with a pair of rare Earth magnets. While I mentioned the blade guides there, I’ve found that the bearings used on this model are excellent and very easy to adjust. It is only on the lower thrust bearing that you need to use a 10mm spanner and it’s not easy getting the tool in there, either. All the others can be fine-adjusted between finger and thumb. 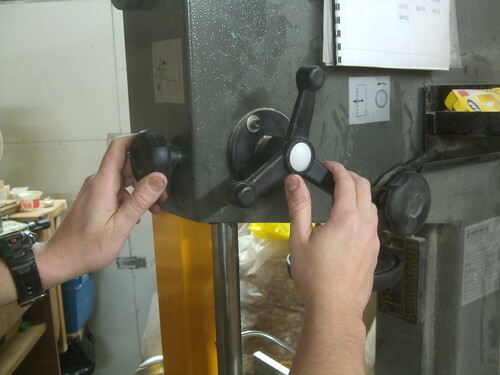 Adjusting the side blade guides. Simple adjustment of the upper thrust bearing. But not as easy down below. While we’re down below the table, I’d also like to point out that this saw features an excellent system for levelling the insert plate flush with the cast iron table. 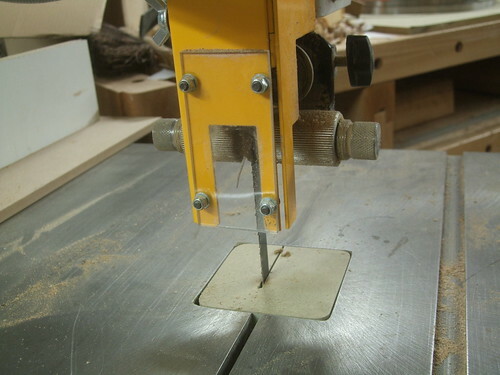 This is something I hadn’t seen before, on a bandsaw. The original plastic guard was pretty chewed up when my saw arrived so, when it came to fabricating a replacement (18mm + 12mm MDF), it didn’t matter that the thickness was out by 1mm or so. Levelling screws for table insert. Both doors (which have to be opened and closed as one) are secured with a large hand wheel [sorry, I can’t think of a better name!] though, I’m sure I’ve read thathe current regulations stipulate any doors must now be tool operated…? Well, regardless of that, it is reassuring to know that both doors, here, are fitted with safety interlock switches – if one door is opened while the machine is running, it automatically cuts out the power and the motor brake kicks in immediately. When I say immediately, that is quite literally what I mean! For general usage, I worry that this is a little sudden and abrupt; in time, it could do harm to some part of the machine, which reaches 1,600 RPM at full speed! When I switch off, I like to hold the red button down for three or four seconds which delays the action of the brake kicking in and allows the motor, both wheels, drive belt and pulleys to slow down at their own rate, initially. There’s nothing in the manual that covers whether this is right or wrong… Either way, the saw still comes to a complete stop well within the regulated ten-seconds. Having recently spoken to Record Power about a different matter, they have assured that this form of DC braking (as on this 401E model) tends to be more aggressive than the electro-mechanical systems and that it should not have any effects on any components of this machine. 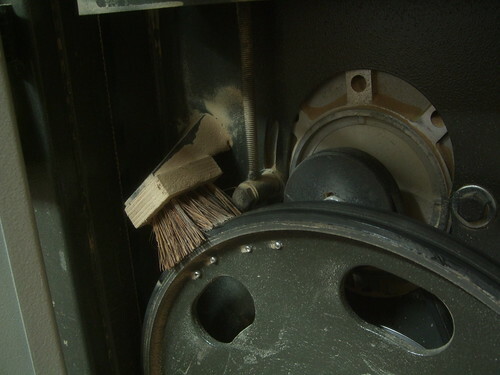 Inside the bottom cabinet is a large brush for keeping the tyres clean from sawdust – though, the stiff brush fitted here (which is very effective) looks like it may have been a mod fitted by the previous owner. You can also just see the drive belt behind the wheel though, it doesn’t look as though this is easily-adjustable for running at a slower speed (useful for cutting plastics). There’s nothing in the manual about this, either. While I admit to not using dust extraction often enough, it is nice to see that the waste is mostly directed towards to the 5in/125mm dust extraction in the bottom left of the second photo, below. On my previous saw, this outlet was in the bottom right hand corner and it didn’t seem to have much effect. Above the table, the blade is very well guarded, with a hinged front-piece that means, in the event of a blade coming off the tyres, it won’t be able to ‘get you‘ that easily. This certainly isn’t a feature you’d expect to find on a budget-priced saw and I’ve even worked with a couple of large Wadkin machines where the guard wasn’t as sophisticated as this. To the left, there’s a thin length of steel that seals off that side of the guard. It runs up inside a channel below the top cabinet but, as crude as it looks, it does its job well (I only know this because I had a blade break, not long ago… :roll:). A sheet of clear plastic [hopefully shatter-proof?] allows for clear visibility of your cutting line. 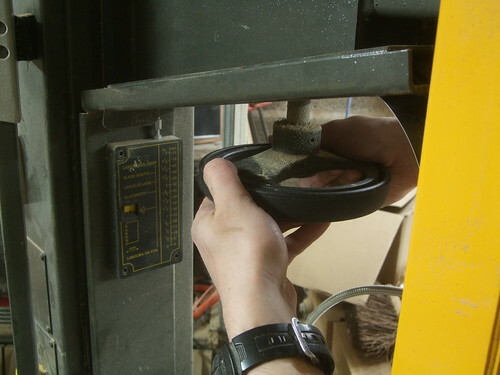 Height adjustments for the blade guard are made by this large three-pronged wheel and locking knob. 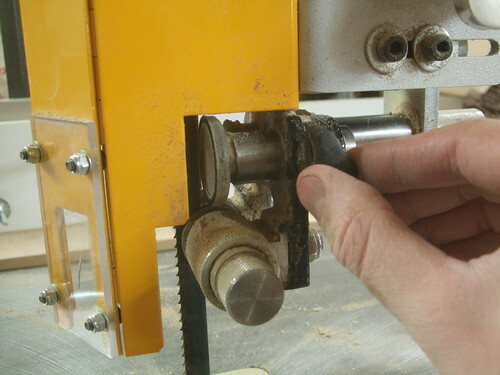 You really need two hands on the wheel to actually move adjust the guard, where as, some other saws (looking at the Record Power and Jet machines) have a slightly different wheel (similar to what you’ll find on a planer/thicknesser) that can easily be rotated with one hand. To me, this is a slight downside as it makes the job that little bit more awkward. 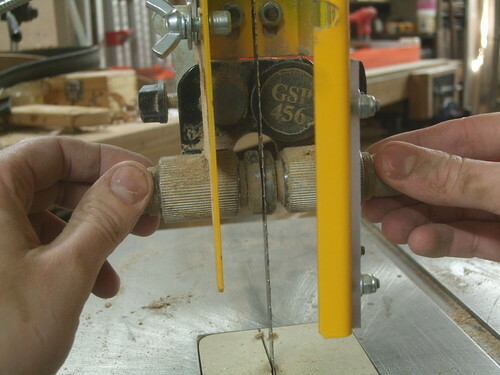 As with many of the cheaper, smaller saws (than this one) on the market, raising the guard up to more than half its maximum height means you’ll also have to readjust the upper guide bearings a tad (though, this could be because I’ve re-tyred the wheel myself…). 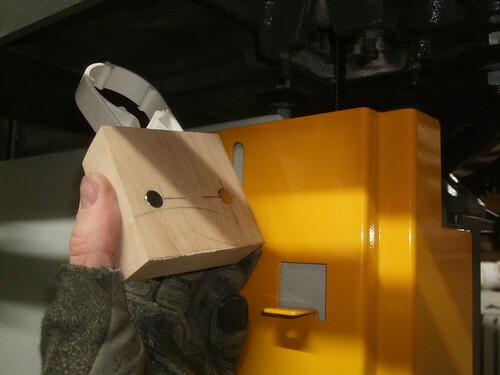 On top of the cabinet, an eye-bolt is secured in place – this is a common feature on modern machines weighing over 100kg, which allows you to lift and reposition such a machine using some kind of hoist (yeah, as if we all have one of those in our woodworking ‘shops!! :-D). 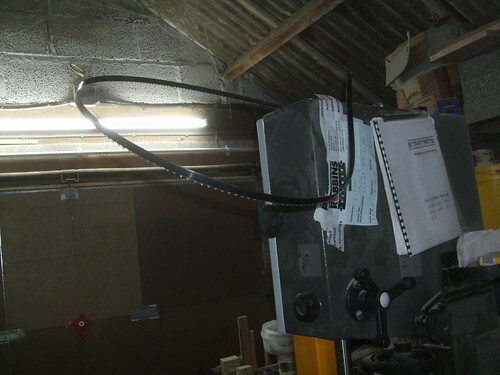 As much as I struggled to get this saw through the garage door, I don’t believe that hiring a hoist (which, presumably, would have to be even taller?!) would have made the job much easier [I’m dreading the day I have to move this again in to a new workshop!! :?]. 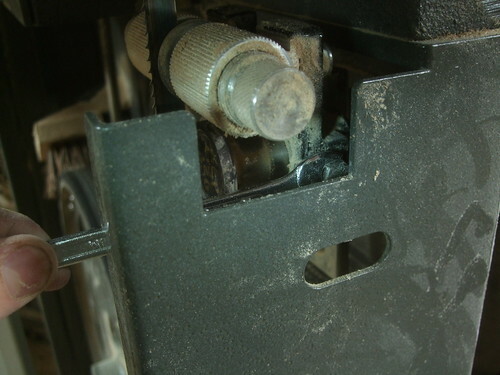 On my machine, there is the issue of a rectangular hole on top of the unit. It seems to allow the wheel to travel vertically for extra tension on wider blades but, it’s certainly not something I’d seen before. Nor had I expected to come across this. 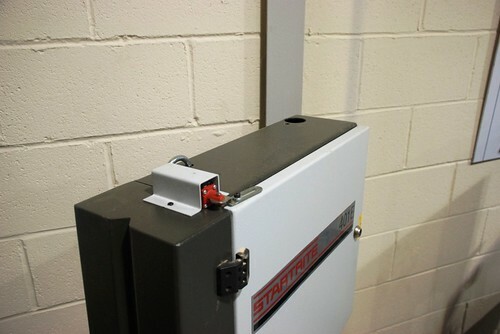 I’ve spoken to Record Power (the manufacturers of Startrite machinery) about this and they have confirmed that it is not part of their standard specification, as it allows the user access to fast moving parts within the machine and, therefore, would not meet the criteria for CE approval. How it should be, for CE approval. 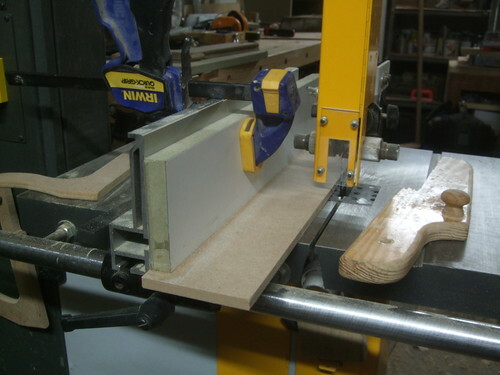 I’ve since added an MDF cover plate to my saw, which is fitted with several 10mm diameter rare earth magnets. 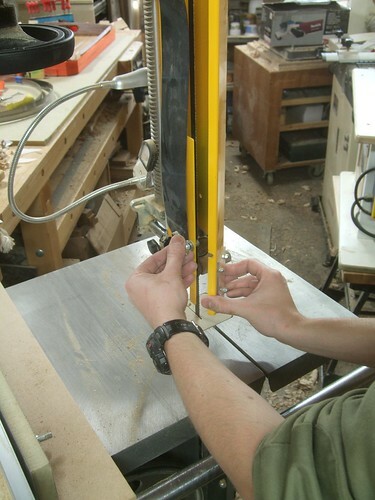 A little further down and we come to one of the key features in the purchase of this bandsaw – the rack and pinion mechanism for controlled table tilt! Table tilt via. 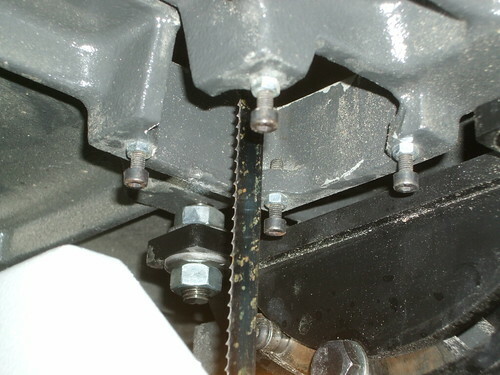 rack and pinion mechanism. 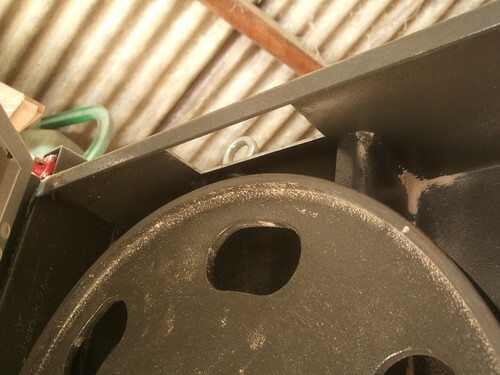 One of my favourite features is the large hand-wheel for tensioning; situated underneath the top cabinet, where smaller saws tend to have an inferior small knob on top of the machine. There’s no quick-release lever on this saw, which did disappoint me, at first. But, with the wheel being so large, it’s easy to get two hands around it and, for a ¾in blade, I can say that it doesn’t take long at all to wind the tension up or down. There’s also an excellent, clear tensioning scale (just visible in this next shot) that clearly displays the correct amount of tension for widths of blade up to 30mm. It’s on a par with my own tried and tested method of ‘plucking‘ or twisting the blade, where as, on a cheaper saw, the included scale would often leave the blade under-tensioned for deep cuts. 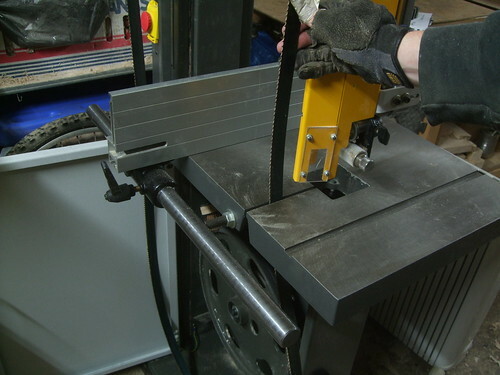 Another thing I was looking for in my bandsaw purchase was the facility to be able to remove and replace a bandsaw blade without having to touch the rip fence or supporting rail. On my smaller SIP saw, this was real bugbear; having to unbolt the mounting rail for the side fence each time. I was previously looking at the Record Power range, where it appears that this may also be a problem. On the Startrite 401e, you don’t have to touch the rail or move the fence, as there’s plenty of room to slip an old blade out and fit a new one back in again. This saw has a slot that runs parallel to the cutting direction. 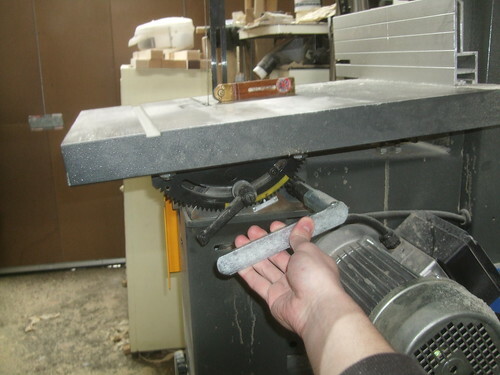 On the bandsaws in the Jet range – and, even, Startrite’s 352e – tables now have a slot running from the right-hand side of the table; at 90° to the side of a blade. This is a feature I really like, as it means that any slight distortion in the cast iron won’t effect the accuracy of your cut. The two halves of the table on this saw are very slightly out of alignment but, it’s not really enough to make a huge difference and it’s certainly not as bad as what you’d expect to find on a cheaper saw where (presumably), as their machines are ‘built to a price‘, the cast iron is rushed through the milling process without having being given enough time to season or settle (yes, it’s a lot like solid wood!). Blade’s can easily be removed and replaced. I should also add that, should you need to remove the fence to gain access to the full 400mm throat distance (width of cut), given the achieved maximum height below the guides, there’s plenty of room for the fence to swing backwards (without hitting the top cabinet) so that you can then slide it off the end of the round bar. Enough room to swing… A fence! Staying with the rip fence as I look to wrap-up this review [thanks for sticking with me, this far!! ;-)], it’s a sturdy, wide piece of aluminium, which slides over a mount attached to the round bar. Two socket screws below provide plenty of adjustment for pivoting the fence to adjust the angle (when correcting for blade drift) and the aluminium part can be removed, flipping 180°, turned over 90° and reattached to give a lower fence that’ll fit under the guard when you want to make a cut on something thin and less than 3in wide. Here, there is also a downside – each time you remove the fence, you lose the cutting angle and it will need to be readjusted – or else, you’ll find your timber drifting away from the fence in the cut; maybe even binding against a wider blade. I got over this by making a simple MDF attachment that clamps on to the taller fence. This allows me to split a length of 25 x 6mm MDF in half (for example!) with the guard down safely. Another thing I noticed (only very recently, in fact) is that the aluminium part of the fence is very slightly twisted along its length, so it doesn’t sit perfectly square to the table at several points. This meant that, while ripping some oak veneers for a curved cabinet last week (2mm thick), they came off the back of the saw with a slight taper to their thickness. Nothing more than 0.5mm but, across an 8in width, it was noticeable. Therefore, and as you’ll see in the final (!!!) photo below; I’ve shimmed it out with several strips of masking tape [blue tape, in fact! ;-)] of varying lengths. It’s not pretty much spot on. Though, as good as this blue tape seems to be, I can’t see it lasting too long with regular usage… Therefore, I’ll probably attach a scrap of 1mm laminate to the face using double-sided tape. 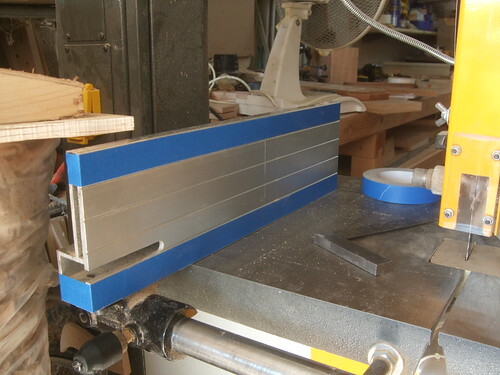 Shimming the fence square with blue masking tape. If you have any questions or if you feel there’s anything I haven’t covered, please leave a message or e-mail me. There’s also a three-phase version of this saw available, which may be worth a look. 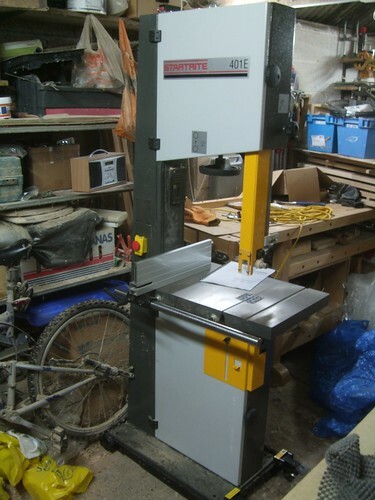 Excellent writeup of the bandsaw, seems to be a real cracker you have there, and has done nothing to dampen my desire to go for a startrite despite sorting out my baby axminster. I might just have to fight the wrath of SWMBO and order one at some point, at this stage, its just a matter of when not if. Hey there Olly, I don’t suppose you could tell me what sorta price you paid for this and if it was used? I am looking for some machinery and I have been advised to go with used equipment but I cannot see anything in my price range. Mine was a private sale. On eBay or similar, I’d expect to pay around two-thirds the original price for something in good condition and only years old. eBay is often full of great deals and bargains. I’m sure you could get something suitable for less than £500 (maybe even much less). It’s often a chance of finding one not too far from home. Yeah I won’t hold my breath for the one to far from home, I have monitored ebay for sometime and nothing worth have sells in cornwall, I think they are a bunch of hoarding monkeys. But to hear they were £1400 2 years ago and now they are over £2000 new means I am going to have a up hill struggle to find something decent, even the saws that were selling for £500 2 years ago are now £1000 used it seems. That is a shame but eBay haven’t helped things by upping their fees in the last few years. It might also be worth keeping an eye on any local papers. 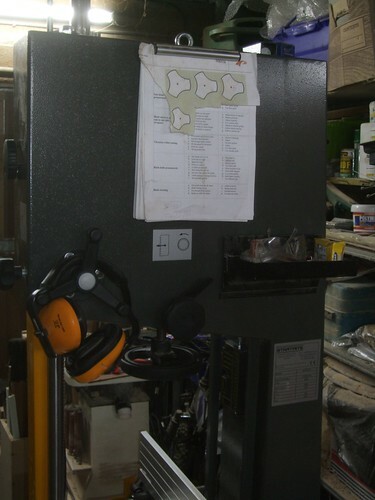 What are you looking to do with your bandsaw? Do you really need one with such a large cutting depth? I started out with a 12in. (wheel diameter) saw and you can do an awful lot with one of those. Blade selection is as important as anything else, in my opinion.